One of the most famous mountains in the world, Mount Kilimnajaro, often just called Kilimanjaro, is the mountain with the highest elevation in all of Africa. It’s also therefore the tallest mountain in the continent, measuring up at 16,100 foot (4,900 m) from its base to its peak. The mountain is actually a stratovolcano with three separate volcanic cones, named Shira, Mawenzi, and Kibo, but has been dormant for a very long time. Kilimanjaro is located in the country of Tanzania, not far from the east coast of Africa and the border between Tanzania and Kenya. It's one of the most well-known mountains of them all and has represented one of the must-visit challenges for climbers, explorers, adventurers, and mountaineers for many years. The origin of Kilimanjaro's name is a bit of a mystery, with various theories and ideas being suggested over the years. Many theories seem to suggest that the 'Kilima' part of the name means 'mountain' and it is believed that various native African peoples admired the mountain's size and greatness for centuries before any non-African visitors ever saw it. During the 19th century, the first attempts occurred to try and ascent Kilimanjaro, but many of them failed, with parties turning back at certain points due to the difficult conditions and lack of preparation. The first successful expedition to the top of Kilimanjaro was completed in 1889 by German Hans Meyer and Austrian Ludwig Purtscheller. The highest point of Kilimanjaro is located on the crater ridge of the Kibo volcanic cone. Upon reaching this point, Meyer named it after Kaiser Wilhelm, the German Emperor at the time, but the name was changed to Uhuru Peak, with 'Uhuru' meaning 'Freedom' in the Kiswahili language. Since Meyer and Purtscheller made it to the top, many other successful expeditions have made it to Kilimanjaro's highest point and thousands of people attempt the climb on a regular basis, with several different trek routes being established over the years. Kilimanjaro's height from base to summit is 16,100 feet (4,900 feet), but its elevation is different. The elevation of a mountain tells us how high it is in relation to sea level, rather than simply measuring its length as an individual landmass. The elevation of Kilimanjaro is 19,341 feet (5,895 m) above sea level. It's the mountain with the highest elevation in all of Africa. When compared to other mountains like Everest, which has an elevation of 29,029 feet (8,848 m), or K2, which has an elevation of 28,251 feet (8,611 m), it’s clear to see that Kilimanjaro is far away from being the tallest mountain in the world, but it’s still an enormous natural monument and a major destination for climbers and mountaineering enthusiasts. It's also worth noting that Mount Kilimanjaro is the tallest freestanding mountain on the planet. Other key locations around Mount Kilimanjaro include the 'Saddle Plateau', which separates the Mawenzi and Kibo volcanic craters and has an elevation of 14,400 feet (4,400 m), Londorossi Gate, which is the start of many treks up Everest and has an elevation of 7,381 feet (2,250 m), and the Lava Tower, which is one of the most unique rock formations along the ascent and has an elevation of 15,091 feet (4,600 m). Many other camps and landmarks can be found along the ascent of Kilimanjaro, each with their own elevations and conditions. Elevation gains on a trek up Kilimanjaro can vary greatly depending on which route is chosen. There are seven official routes, named Mweka, Machame, Lemosho, Marangu, Shira, Rongai, and Umbwe. Most routes can be completed within a week, with Rongai being the easiest and Machame usually regarded as the most beautiful, but also one of the most difficult. Climbing Mount Kilimanjaro usually involves a lot of preparation. When planning a trip to Kilimanjaro, it’s important to note that altitude sickness can generally set in at all elevations of 8,000 feet (2,438 m) or higher. As elevation rises, the air becomes colder and thinner, with less oxygen. People who live at low elevations and find themselves in an area of high elevation like Kilimanjaro may therefore struggle to breathe and it takes some time to get used to the conditions. Side effects of altitude sickness can include nausea, headaches, vomiting, and more, so it’s vital to be prepared for this. 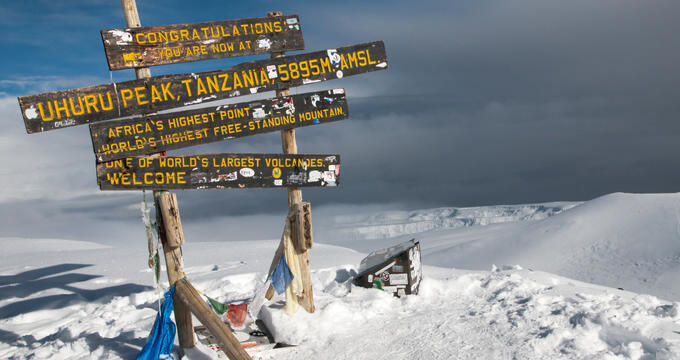 Many treks up Kilimanjaro can involve several days spent at altitudes above 8,000 feet (2,438 m), so altitude sickness can become a major problem for mountaineers and climbers, but not everyone suffers the consequences of this condition.